Every once in a while, players run across a bingo site that is not affiliated with one of the larger networks. They are currently offering a bonus of 200% for bingo plus 100 free spins when you sign up. 200% BINGO BONUSNew players only. 18+. No deposit offer: Players receive 100x 5p bingo cards + £5 bonus spins on Beat the Bobbies. Max cashout £15. Wagering and T&C apply. CLAIM BONUS New players only. 18+. No deposit offer: Players receive 100x 5p bingo cards + £5 bonus spins on Beat the Bobbies. Max cashout £15. Wagering and T&C apply. With an eye-catching welcome bonus and built on Daub software, the creators of Lucky Pants Bingo are doing things differently to the rest of the industry. It's safe to say we like what they do. Back in the early part of 2013, Lucky Pants Bingo was introduced to a fast-growing iGaming Bingo industry. Though not affiliated with any of the large networks, the site has been able to sustain a steady business pattern while building up player loyalty in the process. With a logo represented by a bingo ball wearing bikini bottoms, it is clear that Lucky Pants Bingo is attempting to appeal to both men and women. While the logo would tend to draw men, the purple and pink colour scheme is surely directed towards women. The site is very easy to navigate and all relevant information in easy to find. With plenty of promotions and free bingo games in the offering, it’s easy to understand how this site has remained competitive as a viable iGaming experience compared to other sites. After registering and going through the initial login, players are awarded 20 free bingo tickets along with 20 free spins. This is a great welcome offer for new people signing up and can give players a chance to try out the games before making a deposit. In all cases, bonuses can be claimed by entering the proper Lucky Pants Bingo promo code for April 2019. 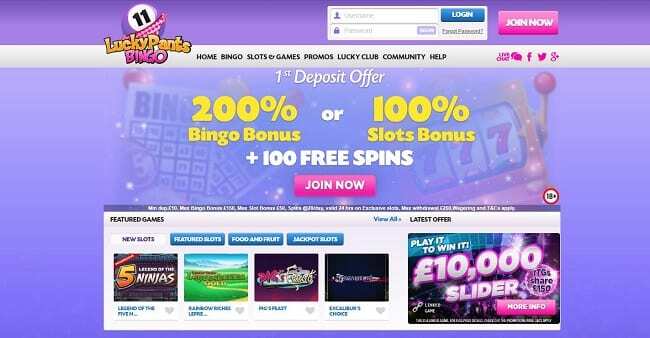 Check out our review of Mummies Bingo here to see another brand with a similar welcome offer to this one. A menu of approximately six promos is always available for players. These promotions are usually available on a daily, weekly or monthly basis and cover reload bonus opportunities, special drawings and cash rebates. A six-tiered Lucky Club offers players plenty of extras, including enhanced services, a birthday bonus, cash rebates and free drawings. The brand has elected to stay with traditional games, though they do offer some unique variations. In addition to bingo, players will also have the opportunity to select from over 200 casino games provided by some of the largest third-party iGaming vendors in the industry. The fare starts with traditional 75-ball bingo. The game is played with a 5X5 card matrix with a free space in the middle. The objective of the game is to be the first player to cover the designated pattern, of which there are 30+ different ones chosen on a random basis. For a little faster action, players might enjoy 90-ball bingo. The game is played with a 3X5 card matrix. As part of the game’s objective, players have three separate opportunities to win a cash prize on each game. The first prize is awarded to the first player who covers one line, the second prize goes to the first person who covers two lines and finally, the last prize is awarded to the first person who covers the entire card. For players who want a little variety, they can choose 90-ball turbo bingo where a ball is drawn every second. Also, they can choose to play 5-line or Swedish bingo, which features 5X5 card matrix, 75 balls and five different ways to cash on every game. Lucky Pants Bingo is run off of a proprietary software platform with casino games integrated from top software developers like IGT, Microgaming, Eyecon, Play’n Go, Bally Technologies, plus other entries from smaller developers. The software is available in download mode or through the use of a web browser in instant play or Flash mode. An embedded random number generator (RNG) is used to provide random and fair gaming results in all cases. Testing and certification of the site is handled by the Alderney Gambling Control Commission. Withdrawals are subject to a 72-hour pending period while identity verification documentation is submitted by the player. Players who like to play on mobile devices will be happy to learn that the brand offers a Lucky Pants Bingo app that accepts players using devices that are compatible with iOS and Android operating systems. This is great for anyone wanting to use the games when out and about and not connected to a desktop computer. Play on your phone and enjoy all the top bonuses just as you would normally. Overall, form our Lucky Pants Bingo review, we think it is a fun and exciting site to join up to, so why not sign up today? You are sure to have lots of fun on this site, so make sure you don’t miss out on the promo codes.